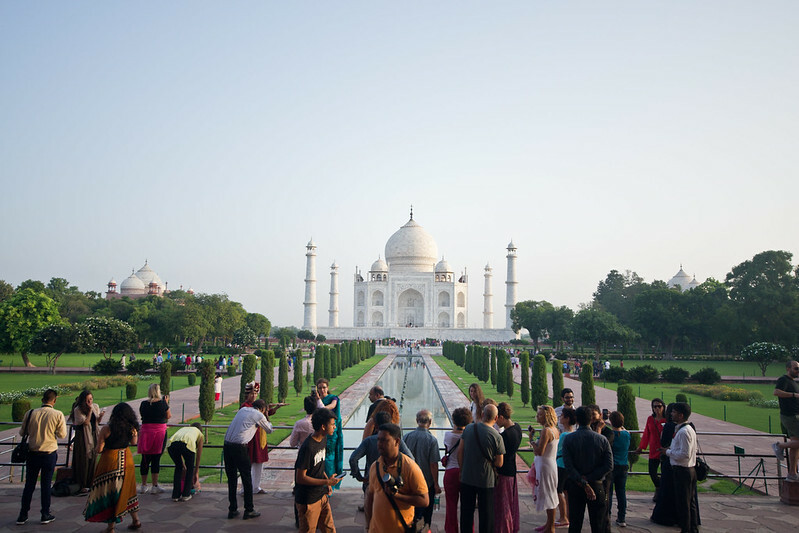 For many, going to see the Taj Mahal is a trip of a lifetime and a highlight of their time in India. Welcoming between 7 – 8 million domestic and foreign tourists every year, one thing you can expect from your visit is that there will be lots of people. 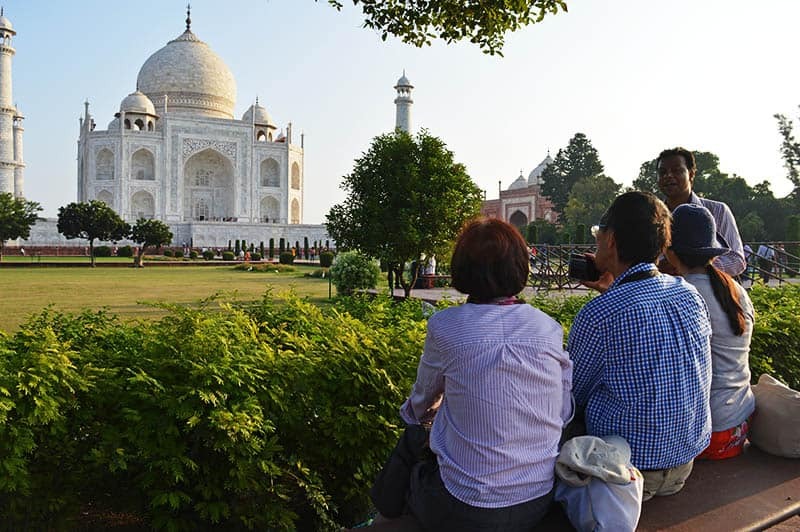 Knowing that, here are 10 tips for visiting the Taj Mahal to make the most of your time at the site. 1. Go early to beat the crowds and the heat. By the time we were leaving, it was very noticeable that there were more people there (and this was at 9 am!). Keep in mind, the cooler months of October, November and February are the most popular with tourists. I was there at the beginning of September and it was hot hot hot! Still lots of people despite the time. 2. The Taj Mahal is open from sunrise to sunset every day but it is closed on Fridays. The entry fee into the complex is 1000 rupees for foreign tourists. Included in your ticket is a bottle of water and shoe protectors for when you’re walking up to the Taj Mahal. 3. After purchasing your ticket, there are electric shuttles that can take you closer to the entryway if you don’t want to walk the whole route in the heat. You must use those vehicles though as ones run on gas (causing pollution) are not allowed near the complex. 4. There are three main gates: Western, Eastern and Southern. We entered via the Eastern gate and didn’t have any problems with lines, but their website suggests using the south gate as the other two can get long lines. All three gates then lead to this inner Southern Gate. 5. There are a number of things that you are not allowed to bring into the grounds and some of them seem really arbitrary. Anything edible is forbidden and you can only bring in the water bottle that is given to you when you purchase your ticket. Also, extra batteries are not allowed. I removed my battery pack from my purse, but I forgot I had a pack of gum in my bag which was confiscated at the entry. 6. When going through the security line, like many other tourist attractions and the airport, there is a separate line for females. To avoid delays, look for the signs above the line and get in the correct one. 7. Like everywhere else in India, it’s important to dress modestly for your visit. This means to cover your shoulders with long pants or a long skirt. Consider wearing a hat to keep the sun off your face as well. While there are a lot of trees on the grounds, when you’re right up at the monument and by the water feature in the center of the grounds, there isn’t much shade. Not much shade in the center here. 8. There are going to be people and lots of them regardless of when you go. However, I managed to get some clear shots with minimal people just by being patient. People will move eventually. 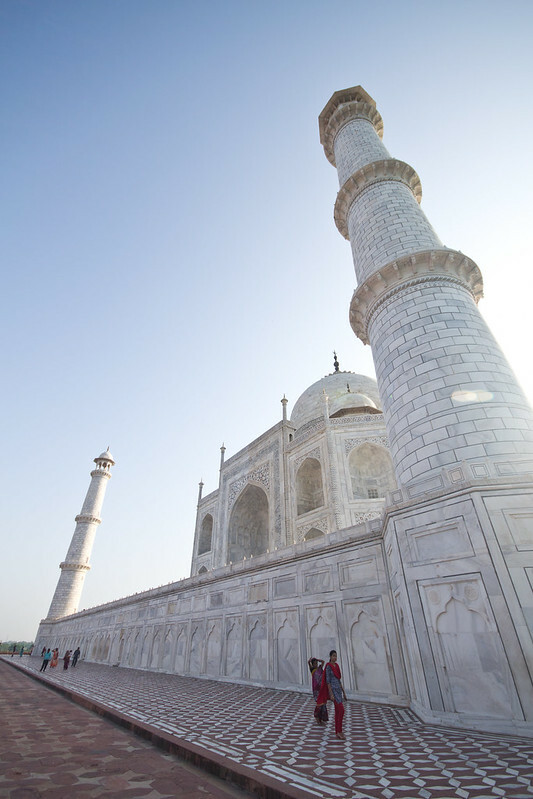 Otherwise, check out how the Taj Mahal looks from different angles. Some of my favourite photos I took were from unusual viewpoints. One of my favourite shots I ended up taking. 9. 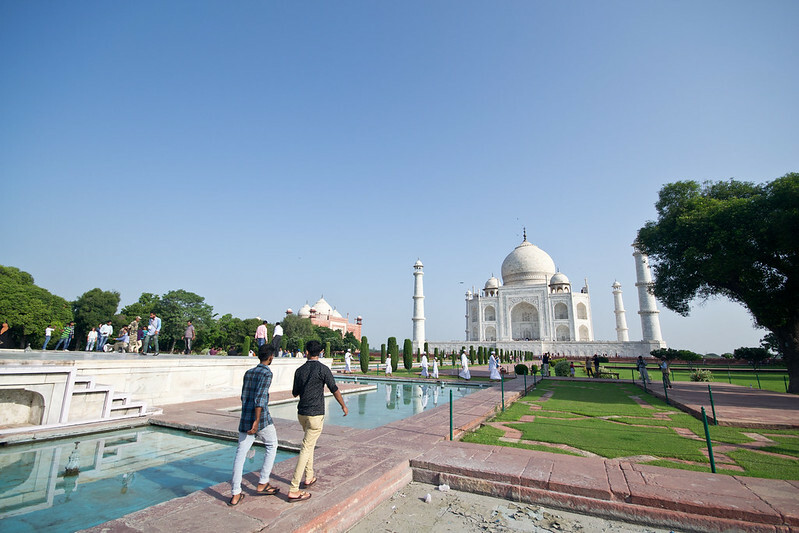 Respect the line when getting your “money” shot of the Taj Mahal with the flowers, water feature and monument behind. Or when you’re trying to mimic the “Princess Diana” snap. Generally, I found all the visitors during my time there to be respectful of who was there first and allowed people to get their photos. There is also a great viewpoint from across the river of the back of the Taj Mahal. I didn’t get a chance to check it out for myself, but some of the photos I’ve seen from that location have been fantastic. 10. As I mentioned previously, the inside of the Taj Mahal was a bit disappointing. Lackluster. There really isn’t much to look at and you’re herded around single file through the building trying to not trip on the walkway that has the odd step here and there. If there is a long line to go inside, I’d suggest just skipping it. There was no line on the morning of my visit so I wasn’t too disappointed. No line to enter. Also, no photos allowed inside. 11. I had a tour guide during my visit who was able to provide a look into the fascinating history and lore of the Taj Mahal. If you’re able to spare the expense, I highly recommend booking a guide. 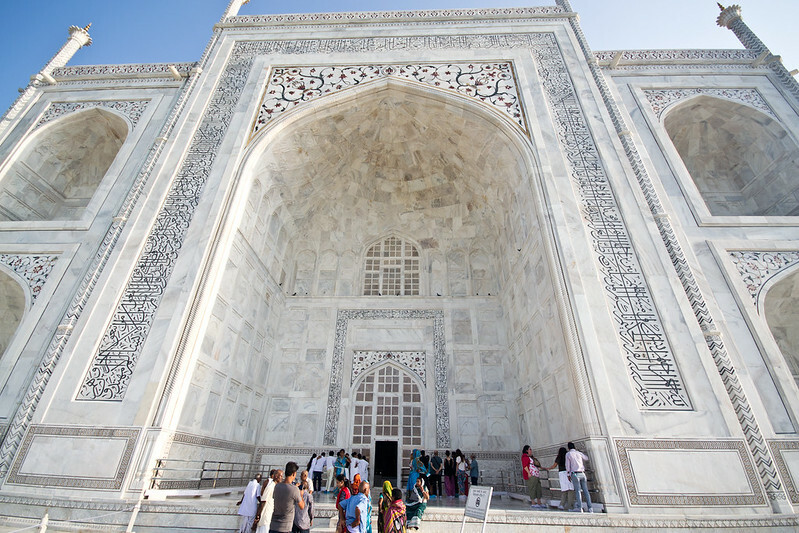 All of the guides that are able to enter the Taj Mahal in that capacity have been certified by the Indian government and undergo training and a test. 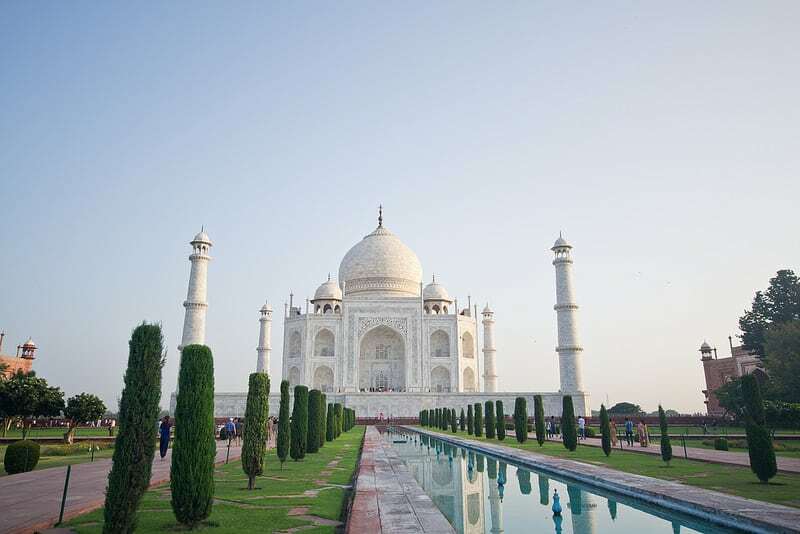 Considering booking one of these multi-day tours of the Golden triangle through GAdventures and visit New Delhi and Jaipur in addition to Agra. Alternatively, if you’re looking for a personalized private tour, I could not recommend my tour guide enough. Looking for accommodation for your trip to Agra? Have you been to the Taj Mahal? What other tips would you add? I wonder if you get there the moment it opens if it’s any easier to get less people in a shot? These are great and practical tips however, my best friends is flying out to India as we speak so I’ll send this her way. It’s interesting that you said the inside of the complex isn’t worth the wait- I’ve found that to be the case with a lot of famous landmarks. Yep, there are definitely way less people in the photos I took as soon as arrived compared to when I was leaving. It was just overwhelming at that point. I hope your friend has an amazing time! Seeing this is on my list and I so appreciate your tips. I had no idea about the food or the batteries, so that is good to know. Also, the line for women. I’d have to go early as I’d melt in the heat. Even in the early hours it was still too hot but granted, I was there in September so it was scalding the whole time I was there. Excellent tips here! Believe it or not, we have not been to Taj yet even though we grew up in India before calling Boston our new home (face covered with palms). But it is a definite when we travel back in a year or so. Haha it’s totally okay. There are so many iconic things in my home country of Canada that I haven’t experienced either! Totally agree about getting there early to beat the crowds. We visited in March and it was busy but not as bad as I thought. I also suggest staying til sunset and being one of the last ones to leave, the crowds also thin out then to. It’s such a gorgeous place! Great tips. I have not been to the Taj Mahal yet. The idea to get there early is great, I can see from your photos that it doesn’t look too busy. Love your shot of the building from the side, it has a really interesting perspective. It’s interesting that you are not allowed to bring your own water bottles in, especially with the heat. Is there a place to refill inside? Thanks for sharing! great tips, When I went there so long ago now it was free entry on Friday mornings and then I think closed for the rest of the day. But I imagine the crowds today dwarf those back then! 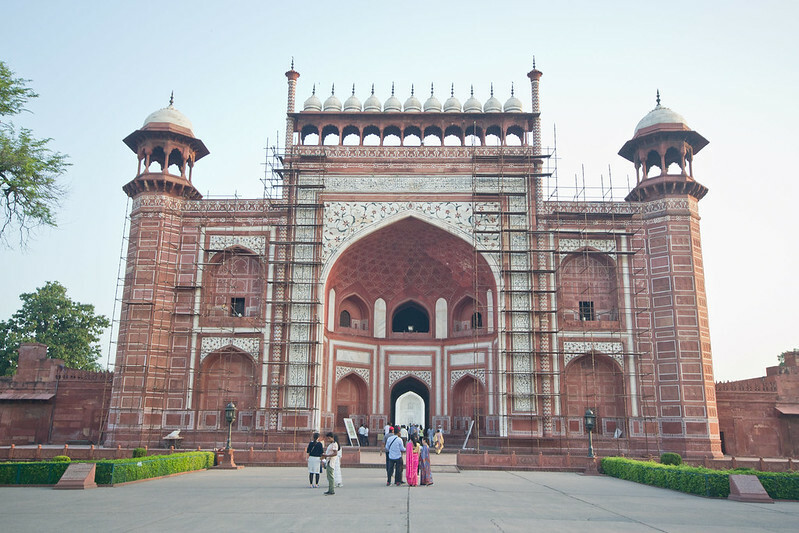 Visit the Agra Fort too from Taj Mahal. My Indian friend took me there. A must visit. Thanks for posting these good tips.